There are a lot of things to keep track of in your paid search account. Keywords, negative keywords, ad copy, geo-targeting, bids, budgets, ad extensions, quality score; the list goes on. Sometimes it’s hard to get everything done, let alone find time to do something beyond basic maintenance, especially if you’re a small business owner. However, tweaking smaller elements in your account can lead to bigger gains in the long run. This has never been truer than right now, when Google has acknowledged their focus on the details and the extras as major supporting players in your overall Ad Rank. Just a few months ago, Google released an update that factors the relevance and impact of your ad extensions into the Ad Rank formula. Basically, an improvement in your ad extensions could lead to a better Ad Rank, which in turn determines your Quality Score and can improve your ad position and lower your cost-per-click. More clicks for less money is definitely a good goal to have and ad extensions are now going to be a good strategy to achieve that goal. 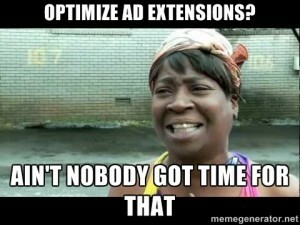 Of course, that’s not the only reason to use and improve upon ad extensions in your Google AdWords account. It’s not as if Google is implementing a change that forces users to do something pointless just because Google’s on a power trip. Ad extensions are, just like ad copy, client-facing marketing copy that extend your existing ad copy and buy you more real estate on the SERP. Your sitelinks, sitelink descriptions, Google +1’s—these are all factors that can influence click-through and conversion rates. Even extensions that don’t receive the click impact the customer’s choices and overall perception of your product or service. If you have an extra opportunity to influence that, why wouldn’t you want to take advantage of it? Here are some of our tips to help you make your ad extensions work for your account. Use Every Extension That Could Possibly Benefit You: This may seem like a big DUH after all the noise made about ad extensions influencing Google’s Ad Rank formula but just to sum it up, at the risk of sounding like a broken record: Mo’ Betta Ad Extensions = Mo’ Betta Ad Rank. If you’re just using location extensions, you’re probably missing out. Not every marketer can use every extension; obviously, if an extension won’t work properly, don’t use it. That’s a waste of time and may actually negatively impact your account. Still, look into what you can do and try something new where you can! Link your Google+ page to your AdWords account with social extensions to show your +1 annotations (unless, of course, you have no +1’s, which is a separate issue altogether). If you have a coupon to go with the offer in your ad, use offer extensions for sales and specials. Not only can more ad extensions improve your click-through rate and ad rank, but you may find that followers, leads, and in-store traffic increase as a result. Optimize Regularly: Sitelink extensions may take a backseat to your ads, but they should still be optimized like ad copy. Even if you’re not A/B testing as rigorously as you would for regular ads, updating sitelinks and their descriptions on a regular basis will keep them from getting stale and improve your click-through rates. Check out your competitors’ extensions to make sure yours stands out from the crowd. Keep an eye out for any extensions that are disapproved or perform terribly so you can edit them or kill them entirely. Always be checking all destination URLs to make sure there are no broken links and traffic isn’t being sent to nonexistent pages. Update your extensions when there are any internal changes, such as locations closing or phone numbers changing, and be sure you’re not showing expired offers in any copy or offer extension. If you maintain and optimize your extensions on a consistent basis, you’ll likely see a greater impact from having them in the first place. Use Call Tracking with Call Extensions: Even if your business doesn’t hinge on phone call leads and sales, the continuing growth of mobile device usage makes call extensions pretty much essential, if only to display the ubiquitous “Click to Call” button on mobile devices so customers can easily contact you. That is, provided the call actually goes to someone at your business who can handle it and turn it into a sale, which is where call tracking comes in. Call tracking allows you to record calls and review them for sales training purposes and lead management purposes. Most call tracking providers capture caller ID info so you can make sure your team is able to follow up on leads. From a paid search perspective, the biggest reason to use call tracking is capturing the lead in the first place. For any business, whether e-commerce or brick and mortar, tracking the lead-to-sale funnel is vital to making and meeting goals. If you don’t know where your leads are coming from, how can you know what marketing efforts are working and which are a waste of money? Whether you use your own call tracking provider or Google’s forwarding numbers, the important thing is you’re collecting as much data as possible surrounding your leads so you can make important decisions about your sales team, your sales goals, and how you’re spending your marketing dollars. No matter what emphasis Google tries to place on the small details, an extension is just an addition, an extra component of the whole. If your account as a whole is not at its best, using more and more extensions probably won’t help your Ad Rank much. If your average keyword Quality Score is a 4, then it’s likely that no amount of sitelinks will knock it up to an 8. Focus on the basics first. If you don’t have time to be actively updating your keyword lists and excluding negative keywords, if you have never had a chance to test and improve your ad copy, then pick extensions that you can set and forget. Set aside an hour to create a location and call extension for your physical business location and corresponding phone number; that’s important so that customers can contact you easily just by seeing your ad. If you have some time leftover, maybe choose four great pages on your website that you can set as sitelinks for all your campaigns to help grab your customer’s attention. In PPC Land, as with all things in life, it’s important not to get too caught up in the small things or you won’t be able to see the forest for the trees. The important thing is to spend time in your account where you can, as often as you can. Make a checklist of what you need to do on a regular basis in your account and have time to accomplish each week or month, and go from there. If you’re completely overwhelmed, talk to someone like me; PPC nerds obsessed with both the minutia and the big picture of paid search would love to revamp your account for you. If you’re doing all the things you should be doing in your account and have the time and/or the desire to do something more to really improve your account, start playing around with the available ad extensions. Write sitelink descriptions—consider it extra characters for your ad copy. Test different sitelinks for various ad groups to see if click-through rates increase. Set up call tracking and show your sales team where they’re dropping the ball to see if you can increase close rates. Check if you have any third party reviews you can show with your ads. Try something new and you may be pleasantly surprised by the positive impact it ends up having on your paid search account and, ultimately, your business.